This is the second in a series of three posts focusing on the Chicago and Cook County vital records indexes that are available online. In this article, I'll give you links to the Cook County marriage indexes that I use regularly and summarize their strengths and limitations to help you decide which one(s) will work best for your search. Quick Advice: This is actually a newspaper index known as "Sam Fink's." Use it when you want to find mention of pre-fire marriages, 1833-1871, in newspapers. To learn more about this index, refer to my "Sam Fink's Marriage-Death Index Available on Ancestry" post. 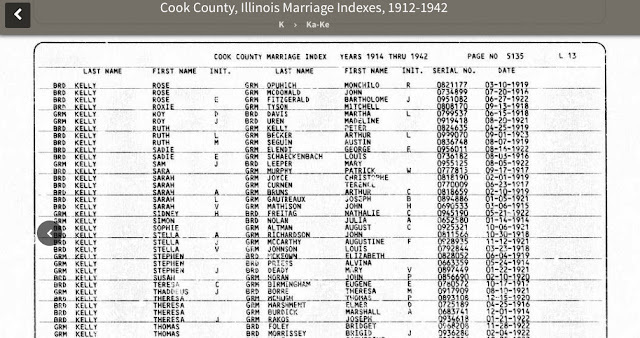 Additional Information: These index entries are included in the Illinois Statewide Marriage Index, 1763-1900 with FINK in the license number column but that index doesn't provide the newspaper codes so it's best to use the one at Ancestry. The marriages in this index end in 1871; it's the death entries that go through 1889. Quick advice: The entries in this index are covered by Sam Fink's Index (see above) and the Illinois Cook County Marriage Index, 1871-1920 (see below). Use this index when you need to locate or confirm a license number for a record found in the FamilySearch Index or when you think the marriage might have taken place outside Cook County. Quick advice: Use this index first if you're looking for marriages for 1871-1920.
provides FamilySearch film numbers as "Reference ID"
Quick advice: This index overlaps the FamilySearch index listed above. Quick advice: Use this index when you need to find marriages from 1921-1942. If you find a match for 1930 forward, go to cookcountygenealogy.com to purchase and download the matching record. If you find a match for 1921-1929, try the county site but know that you will probably need to mail a Genealogy Record Request Form to get a copy. If you are looking for a 1912-1920 record, use the FamilySearch Index if you plan to get the record from FamilySearch microfilm. Quick advice: Use this index when you need to find marriages from 1930-1960. If you find a match, click through to purchase and download the matching record from cookcountygenealogy.com. Quick advice: The search capability on this site seems to be limited to exact spellings within a year range. Create a free account on this site but use the 1930-1960 index at Ancestry.com to search it (see above). It offers more flexibility and you can easily click through to purchase and download records from this site. 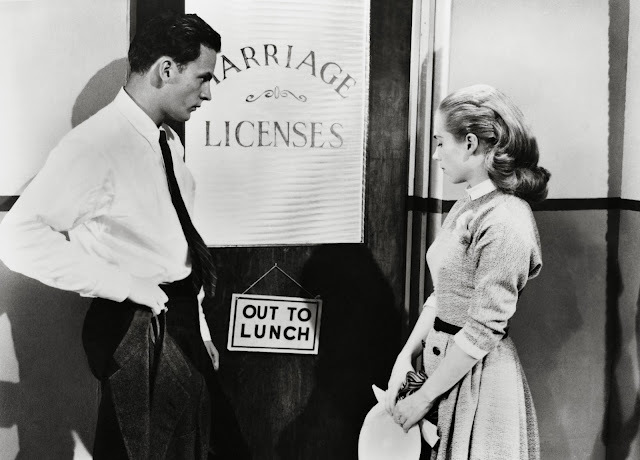 Additional Information: Marriage licenses are available if they are 20 years or older but the online collection is, to the best of my knowledge, incomplete. If you can't find what you need online, you can mail in a search request using the Genealogy Record Request Form. If you're searching for Chicago and Cook County death records, there are a number of overlapping online indexes to choose from. In this post, I'll give you links to the indexes I use regularly and summarize their strengths and limitations to help you decide which one(s) will work best for your search. get records up through 1947 from microfilm available through Family History Centers or in Springfield (the cost of a photocopy if you have local access to the films; $7.50 if you need to order a film from the FamilySearch catalog and have it sent to your local Family History Center; $6.00 + a $.50 handling fee if you get them from me through Genlighten). Quick advice: If you're going to get records from microfilm, use this index for searches up through 1915; it will give you the film number. Use the Pre-1916 Illinois Statewide Death Index to find certificate numbers. If you don't find a match, search the Pre-1916 Illinois Statewide Death Index. If you still can't find a match, email me through chicagogenealogy.com. I can check an alternate index on film and sometimes that helps. If you're searching for records 1916-1922, use the Illinois Deaths and Stillbirths, 1916-1947 first. It's mentioned below. Use the extracted information in this index to determine matches for records 1959 forward. From 1908-1915 there are two sets of Chicago records included in the microfilmed series and this index includes both. It's common to find two entries for the same person with two different film numbers leading to two different records. The information should be the same but one record will likely be an original and one will likely be a handwritten copy. I will share more about this in another blog post. Quick advice: If you're going to get records from microfilm up through 1915, use this index first. If you can't find the name you're looking for, try any of the other indexes that cover the same years. If you can't find a name from 1916-1933 in any online index, email me through chicagogenealogy.com. I can check an alternate index on film and sometimes that helps. Quick advice: This was the go-to index for years and it's still good. If you can't find a name here, try other indexes or try accessing it with Stephen Morse's One Step search page. If you're planning to get the matching records from microfilm, copy the entire index entry. You'll need the full death date and place ("Chicago" is different from "Cook County." If you're going to order film through a Family History Center, don't use the catalog to find the film number. Without going into a complex explanation, let me just say that in many cases it won't work. Use the FamilySearch death index (linked above) instead. Quick advice: If you want to pull up a list of deaths that happened on a certain day or if you're looking for death records from 1948-1988, this is the index to use. If you find records before 1948 and you don't need instant access, get them from film; it's much less expensive. For records after that, just click through to www.cookcountygenealogy.com, pay the fee, and do the download. The rollover text for the "Purchase from Cook County" link says "images and original certificates are only available through the Cook County Clerk's office and clicking will take you to www.cookcountygenealogy.com where they can be purchased for download for $17 + a $1.75 cart handling fee. For records from 1948 forward, this is true, but records up through 1947 can be printed from microfilm available through FamilySearch or the Illinois State Archives in Springfield for the cost of a photocopy. Quick advice: Start here if you need records from 1948 forward. If you find index matches, click through and purchase the records online. If you don't, check the index at Ancestry.com. If you can't find the record for download here, you can mail in a search request to the county clerk or you can ask Genlighten's provider mollykennedy for help. She has access to later Illinois death certificates in Springfield and she will do her absolute best, even submitting multiple requests, to have the clerks find what you need.